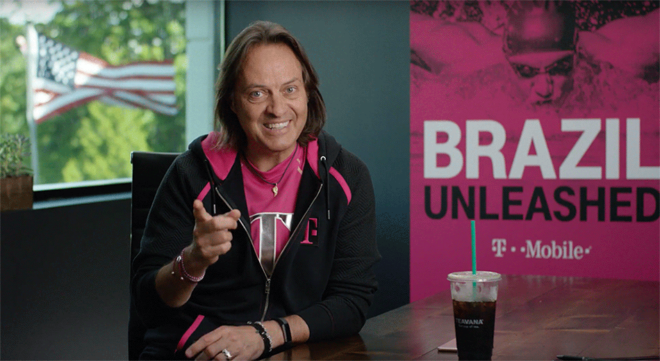 T-Mobile CEO John Legere has recently been publishing blogs to talk up T-Mo’s proposed merger with Sprint, and today another one has gone live. The focus of Legere’s latest post is pricing. He claims that T-Mobile will invest nearly $40 billion in its nationwide 5G network to get eight times the capacity by 2024 than standalone T-Mobile or Sprint have today. T-Mo will then be incentivized to lower its prices in order to get customers onto its network and take up that added network capacity. Legere reiterated that T-Mobile will not charge customers extra for 5G access, days after Verizon said that its 5G will cost subscribers $10 extra per month. Another argument made by Legere is that the merger will be good for customers of AT&T and Verizon. The New T-Mobile’s 5G network will force AT&T and Verizon to respond, with Legere pointing toward an economist’s claim that AT&T and Verizon’s responses will result in up to a 55 percent decrease in the price of a gigabyte of data and a 120 percent increase in mobile data supply for all wireless customers. Opponents of the T-Mobile-Sprint merger aren’t convinced that the deal will lead to lower prices for consumers. At a House Judiciary subcomittee hearing last week, an argument was made that 4-to-3 wireless mergers in Europe have resulted in price increases. It’s also been argued that while T-Mobile is saying that it’ll offer the same or lower rate plans at current or lower prices, there’s no way to enforce that commitment. Legere today responded by saying that T-Mobile has made these commitments in official declarations to the FCC and in sworn testimony in congress. “Not only can we not back away from that — why would we?” the CEO says. The T-Mobile-Sprint merger is still being reviewed by the FCC and DoJ. The FCC recently paused the clock on its 180-day review of the deal so that it could review a large batch of new documents submitted by T-Mo and Sprint. The clock is paused at day 122 of 180. T-Mobile recently said that it remains confident that the merger will be approved in the first half of 2019. My opinion differs and is the opposite. More competition drives up wireless costs as well in several ways. Take for example, spectrum auctions. 4 major bidders drives up the cost of that spectrum. The same holds true with leasing costs on towers. The more competition, the higher the prices tower companies charge wireless consumers. This leads to the costs being passed on to consumers. More equipment is being placed on top of tower which increases the loading on these towers. This is driving the cost of leasing up to the point it is one of the costliest part of building a new site. The idea that spectrum auctions with 4 instead of 3 bidders drive end user prices up is laughable, and thanks for making a case that there should also be more competition with tower providers too. Go to an auction and see for yourself if more people bidding on an item drives up the end price for that item. prices can also go up due to inflation as well. Why do you say 5G won’t kick in for 4 years? That’s not what I read. I read that it will have 8 times capacity of 5G by 2024, so 8 times more than the current companies alone. Capacity is not coverage. 5G itself could be as soon as 2020 or 2021 everywhere. We’ve never seen the speeds 4G can truly deliver. Why do people think we’ll see anywhere near the speeds 5G is capable of? I tend to agree with you. Just wanted to clarify what I read vs. what the other guy stated. Idk though… I always take every “price remains the same” after a merger jargon as bull. But now that I think of it. T-Mobile is in a really peculiar position. Yes, I totally think the Uncarrier strategy has proven effective in the initial years. Now, it’s just air. They have increased their prices, making themselves seem vaguely like old carrier-practices. However, they have done amazing things to the Network! in such a short period, with little advantage, financially. Marketing took a turn for the better. BUT…. being that there’d be one more big player… poised to improve their infrastructure. He would be dumb not to position cheaper costs. Which knowing him, and T-Mobile, they will be wanting to attract those AT&T and Verizon customers like NOBODY’s BUSINESS. I’m for the merger, regardless. Sprint is just… dead air. I am Pro merger as well. They are still cheaper than Verizon and ATT right now. Not by much but they are. They also offer a lot more for the price as well. So if they raise their price by $10 or so, I am still fine with that since I am still getting Netflix for free. It would be like I am paying for Netflix again. Over all I just want better service in a few states I travel too. If I get that, I am happy. Your plan includes access to the technologies, features, and services that you purchased when you activated your account. You may have temporary access to new services while they are being tested or made available for purchase. Temporary access to some new technologies, services, or features ( 5G) may provide noticeable benefits, like significantly increased speeds. Your temporary access may end at any time, but we may begin offering access for purchase. Well, at least it wont cost extra to kill me. The Congressional members who are very anti-merger are using old dated 1980’s/90’s arguments from a time when more people hand landlines then cellphones in order to push the CWA agenda. The CWA was in favor of an ATT/T-Mobile tie-up in 2011 where way more jobs were said to be lost but the CWA (a for profit business) saw an opportunity for every T-Mobile employee to join their union. This time around they are adamantly against the merger for a fear of losing potential new CWA signups. The CWA could care less about the customer. They could care less about jobs just the ones that get them a monthly stipend from each. John Legere has given excellent testimony highlighting the benefits of the combined companies highlighting all the potential jobs that could be created in the tower/construction sector with that $40 billion investment. But most Congressional freshman against this merger do not understand the industry or the technology to see past the outdated arguments because the CWA donates to their cause. I have no issue with unions. In fact I’m a progressive who usually supports them. But in this case I vehemently disagree with their tired old tactics that do not apply to a mobile telecom company trying to transform itself into a 5G mobile broadband and TV service provider. By denying this merger solely on the basis of unproven/alleged job losses the CWA is pretending to foretell the future (as if they’d know) and maintaining the duopoly status quo allowing Verizon/ATT to gouge customers and profit handsomely while keeping T-Mobile/Sprint in the shadows. Picking business winners and losers is not the job of Congress and I’m confident both the FCC and DOJ will see this.